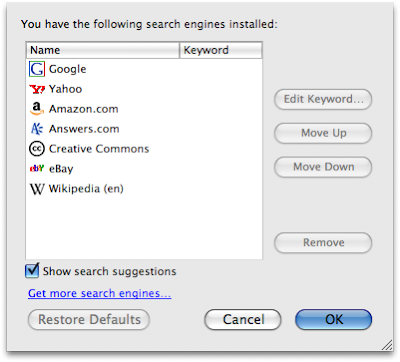 A New Mac Tip Every Day: The search field in Firefox! The search field in Firefox! Firefox can auto-complete what you enter in the search field. It is possible to enable/disable this feature by clicking on the search engine icon at the left of the search field and choosing "Manage Search Engines...". You can then check the "Show search suggestions" checkbox. Thanks for sharing Glims! Its Great! Sharing the internet connection from tethering! Country code with Skype Out! Email fowarding and Mail rules! Assigning a color profile in Preview!